Tomorrow, July 1, 2015, SDO will perform an EVE cruciform calibration material. From 1800-2230 UTC (2:00-6:30 p.m. ET), SDO will look to and fro and up and down to allow EVE scientists to track the aging of their instrument. Here is a collection of magazines and books that have used an SDO image as part of their cover art. There are 34 covers, and another due to come out this week! 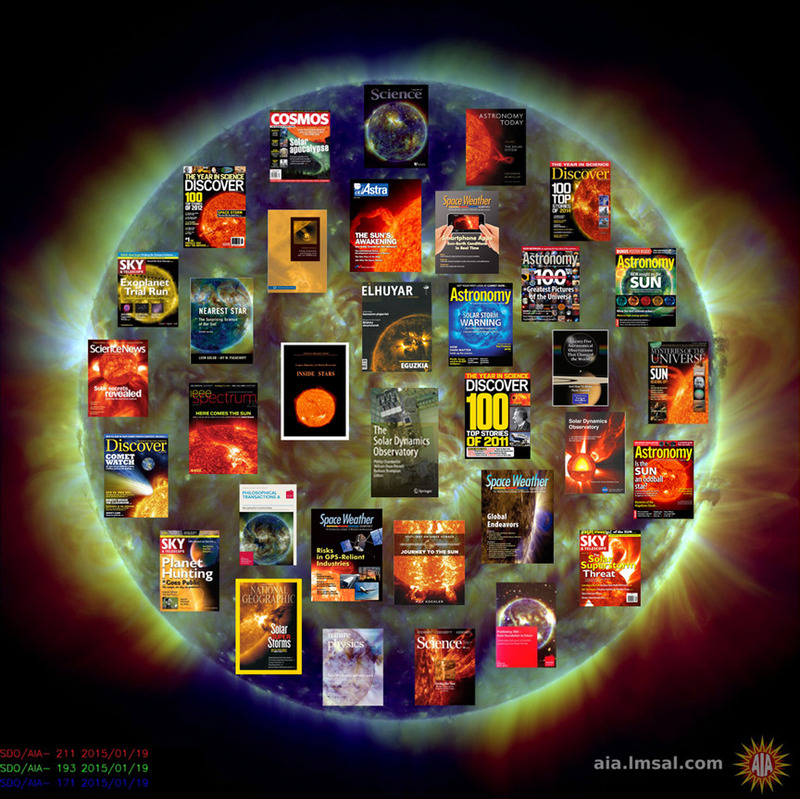 Three covers do not include an SDO image. The SDO Science Definition Team report is the beginning of the SDO mission and features SOHO artwork. The SDO Book in Solar Physics has a picture of the spacecraft on the cover. But the most intriguing is the book "Twenty-Five Astronomical Observations that Changed the World," a volume in the Patrick Moore Series on Practical Astronomy. It has a picture of Saturn, Titan, and Epimetheus on the cover. Inside it says that the EUV observations of comets near the Sun by AIA is one of the 25 observations that changed the world. That honor earned the cover a spot on the SDO Covers! The SDO data system is undergoing an upgrade today, and there will be no images available until the upgrade is completed. We're very sorry for any inconvenience. A Flare, A CME, A Storm! Yesterday we saw an M6.5 flare from active region 12372 followed by a filament liftoff, which turned into a coronal mass ejection, which became a a strong geomagnetic storm. 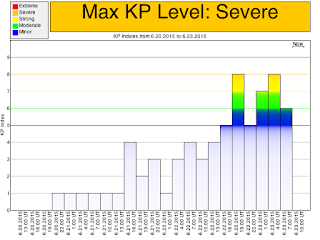 Here are the NASA iSWA Kp values for the last four to show you how the Earth responded to the CME. Kp is a measure of the magnetic storm intensity, averaged over the many stations that measure the Earth's magnetic field. The NOAA SWPC has issued a G2 alert for today, meaning moderate storm activity should continue. 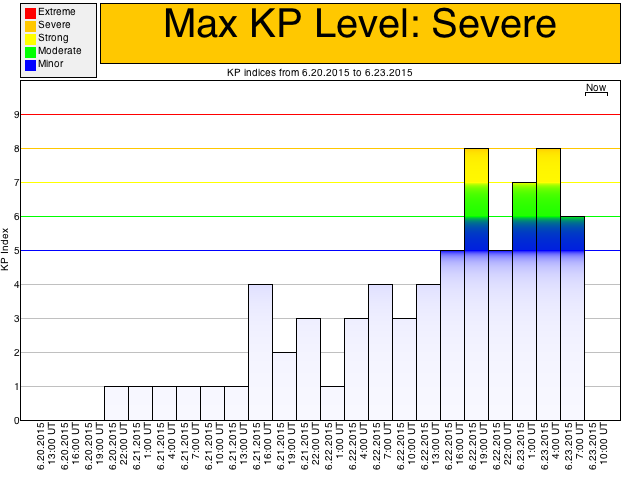 The Kp index is described at the Helmholtz Centre Potsdam - GFZ German Research Centre for Geosciences. Soon after the flare, another filament rose off the surface. It will probably strike the Earth's magnetosphere tomorrow (June 24). This means the geomagnetic storm will continue for awhile. Great aurora come from these storms, but they also produce energetic particles and currents in ground-based pipelines and electrical wires. Welcome to the declining phase of Solar Cycle 24!